During my first trip to Haifa in 2013 I already noticed that this city is more mobile than other cities in Israel where I felt a bit locked and immobile on Friday, Shabbat and Holiday. Coming from Berlin, where there is always a bus or a subway even during the night and on holidays, I am pretty spoiled in terms of public transportation and being mobile. 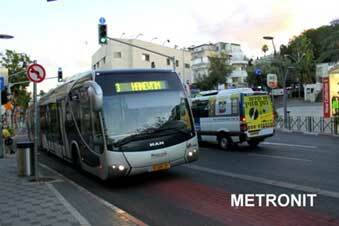 Haifa is Israel’s only Jewish city which currently offers bus services on weekends and holidays. Understanding the public transportation system in Haifa took me some time and asked for a retrospect. The third largest city of Israel – also called the capital of the North – is located between the Carmel Mountains and the Mediterranean coast and offering a pleasant climate. Because of its topography and the shape of the bay, the sea is always a constant companion and lots of apartments have a nice view or even a rooftop invites to stay. Sadly, the city is more a port city with an industrial atmosphere in the downtown bay area and the access to the beach is pretty limited. Maybe Haifa would be more popular like Tel Aviv if there would be more beaches to swim and relax. 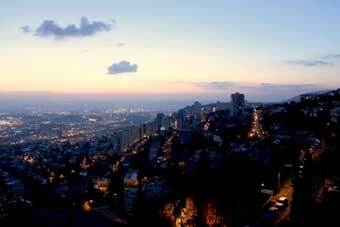 Haifa is also known to be a “mixed” city with coexisting Jews, Arabs, Muslims, Christians, Druze and Bahais since before the liberation war in 1948. During these years the transit lines were offered by Jewish and Arab companies. Jewish companies offered transportation services on Shabbat in order to compete within the Arab societies that offered bus lines in parallel to the Jewish bus services and operated also on Shabbat. Besides that, security reasons played a certain role as well because they wanted to prevent the entry of Arab lines into Jewish neighborhoods on Shabbat which served the British mandate. 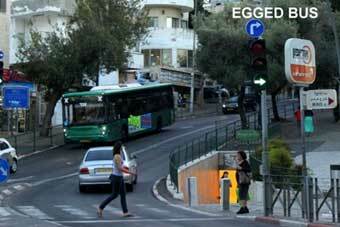 After establishing the state of Israel the government decided to keep the status quo and therefore public transportation in Haifa is offered on Shabbat. The main public transport for the city and intercity transport are buses from the company egged. But there are some other ways to get around and to be mobile like the new busses called Metronit – a guided bus transit developed by the Dutch Samenwerkingsverband Regio Eindhoven –, small subway called Carmelit and the shared taxi vans called Sherut, which is mainly for intercity transportation. On Fridays the busses are running till sunset and start to serve again in the evening at 11pm but certain streets are closed. The religious community opposed to the operation of the transport services at Sabbath. In these areas they even put manually some barriers to block the entry. This is causing problems for some areas because main streets are separated from other neighborhoods. 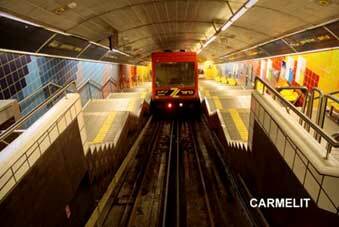 The Carmelit subway – which is more a 6-stations funicular than a subway – is also running till sunset and starts on the next working day which is Sunday in Israel. The Sherut is running on weekends as well but they have special prizes during the weekends. The Metronit is running the whole weekend but it does not serve all needed areas. The Israeli Railways is not working on Shabbat although the British train operated before the establishment of Israel on the Sabbath. One of most important lessons I had to learn in Israel is that things are working less formally compared to Germany: in the university, in bureaucracy, the dressing way, how to make social connections and in transportation systems. 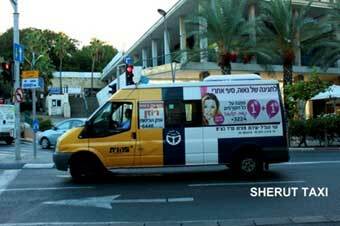 For example the Sherut has no bus stop. It can be also seen as a big advantage that the Sherut is stopping over anywhere along the route by acclamation so that it is more convenient compared to busses. The city is not providing a one good system of public transportation; it is more a network of several ones. And given the fact that the main way of being mobile is offered by the bus people or students especially have no other option. Being mobile on a bike is unusual, most of the time sporty to drive up the hill and no real alternative. I live in a mixed neighborhood in Hadar (between downtown and the Carmel Center up the hill) which is not always considered as a good area to live. The city wants to get students to live here and improve the neighborhood with young people. The main problem is that certain areas are badly connected to the Haifa University or the Technion. Students take around 45min or even more by bus to these universities in opposite to 15min with the car. Being mobile also means to bring time and to spend time in the bus. Thankfully, some bus drivers listen to good music offered to the whole bus clients.